Wow. Has it really been nearly six months since I wrote a blog post?! Yes, it has been that long! I have no good excuses...just life. I've been a busy lady of late. Besides working my real job, I've been busy creating a few quilts, too. I also made the cute little Dresdan Plate in the photo above. 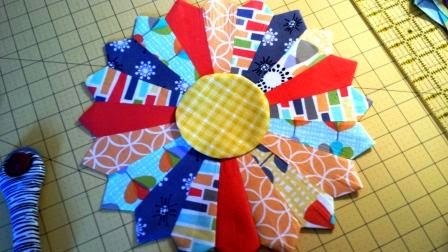 I'm playing around with Petal Pinwheels fabric in order to compete in Michael Miller's 2014 Fabric Challenge hosted by The Modern Quilt Guild. It's funny. My last post (yeah, the one in November) dealt with another Fabric Challenge. That one was also hosted by The Modern Quilt Guild, but the fabric was from Riley Blake. Unfortunately, I didn't win that challenge, but I did get a lot of great feedback from the other participants. I'm not confident I will win this Challenge either, but it's fun participating and I love just seeing all the creative projects everyone comes up with! Gosh, I feel like I've grown leaps and bounds about quilts and quilting in the last several months. Honestly, I don't think I would have attempted sewing a Dresdan Plate six months ago. I just thought it was too hard! I've learned so much just by doing. I've also done a lot of reading as well as watching online tutorials. 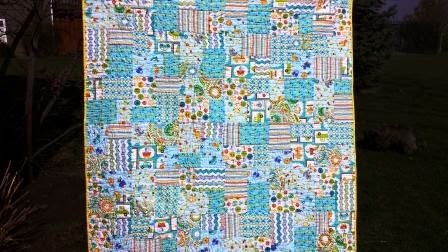 I bet you have heard of Jenny Doan from the Missouri Star Quilt Company! I'm pretty sure I've watched every You Tube video she's made! A few months ago I even got to meet her in person! My local quilt shop hosted a trunk show she presented. It was neat getting to see some of the quilts she's made online in person. They are very nice and she is too! Here are a few of the other quilts I've finished in the last couple of months. Excuse the terrible photography. I'm currently working on getting a better camera. It feels great writing this post. I've missed this so much. I pledge to get back online and share more of my recent projects and thoughts on this quilt journey I've been on this past year. I hope you hang in here with me. Thanks. Talk to you again soon! so glad to see a post!!!! I miss reading your blog!!! [b][url=http://www.jordanivf.com/images/coach-factory-outlet.html]coach factory outlet[/url] [/b]Planned Parenthood affiliates have received about $680,000 per year from the and provided about 170,000 clinical breast exams and 6,400 mammogram referrals through those funds, mainly to low income and minority women. [b][url=http://www.aljeezaspm.com/cpanel/bin/coach-store.html]coach outlet stores online[/url] [/b]Former Pewaukee coach Clay Iverson remembers an ultra athletic, 225 pound specimen. The staff moved Watt from quarterback to the defensive line so he could make a greater impact on the run first team. Memories of Watt scooping up a fumble and flipping the ball behind his back to a teammate are still fresh. Other times, they'd throw him jump balls. [b][url=http://www.jordansif.com/images/discount-coach-handbags.html]handbag coach[/url] [/b]The governor, who said his own personal security had been beefed up recent days, did not rule out the possibility that the Clements killing had been ordered by jailed white supremacist gang leaders targeting public officials from behind bars, reports Reuters. المنارة هي أهم الشركات المتخصصة في التنظيف الشامل على مستوى الإمارات المتحدة تقدم خدمات ذات مستوى عاليبجودة منقطعة النظير فهي عنوان للتميز والرقي حيث أن سياسة شركة تنظيف منازل فى الشارقة في جميع تفاصيلها تهدف إلى إرضاء العميل وتوفير جميع السبل المساعدة على ذلك . الشركة الاولى في مجال التنظيف وتنظيف الخزانات الشركة التي تعمل جاهدة على اسعاد العملاء وتلبية خدماتهم بكل سهولة ويسر وبدون اي مصاريف اضافية . شركة تنظيف بالبخار بدبي نحن شركة متخصصة في تنظيف الأدوات المنزلية الحديثة في دبي. وهي تعتمد على أفضل طرق التنظيف الحديثة من خلال الآلات والأجهزة التي تحافظ على تنظيف المواد الخام للأثاث. تقوم شركة التنظيف في دبي بتنظيف الأفران والسجاد والموكيت بدقة وسرعة. تدريبهم على أفضل طرق التنظيف. Welcome! I'm Angela. I'm a fabric lover (and hoarder), sewist, and I'm hooked on quilt making! I do hope you enjoy your visit!